Use PL/SQL package procedures to administer Oracle Resource Manager (Resource Manager) to allocate resources to pluggable databases (PDBs) in a multitenant container database (CDB). You understand how to configure and manage a CDB. You understand how to use Resource Manager to allocate resources in a non-CDB. You can also administer the Resource Manager with the graphical user interface of Oracle Enterprise Manager Cloud Control (Cloud Control). In a CDB, workloads within multiple PDBs can compete for system and CDB resources. Resource plans solve this problem. You can create, enable, and modify resource plans for individual PDBs. A set of dynamic performance views enables you to monitor the results of your Oracle Database Resource Manager settings for PDBs. Resource Manager can manage the workloads for multiple PDBs that are contending for system and CDB resources. You can specify how resources are allocated to PDBs, and you can limit the resource utilization of specific PDBs. The principal tool is a CDB resource plan. Resource Manager can manage the workloads within each PDB. The principal tool is a PDB resource plan. In a specific PDB, it allocates a portion of system resources obtained in the preceding step to each session connected to the PDB. Resource Manager manages activity in the root automatically. To complete a task that uses the DBMS_RESOURCE_MANAGER package, you must have ADMINISTER_RESOURCE_MANAGER system privilege. In a CDB, background and administrative tasks map to the Resource Manager consumer groups that run them optimally. Use initialization parameters for control memory and I/O in a PDB. "Creating and Configuring a CDB" and "Creating and Removing PDBs and Application Containers"
A performance profile for a set of PDBs can specify shares of system resources, CPU usage, and number of parallel execution servers. PDB performance profiles enable you to manage resources for large numbers of PDBs by specifying Resource Manager directives for profiles instead of individual PDBs. A parent-child relationship exists between a CDB resource plan and its resource plan directives. Each directive references either a set of PDBs in a performance profile, or a single PDB. You can specify directives for both individual PDBs and for PDB performance profiles in the same CDB. No two directives for the currently active plan can reference the same PDB or the same PDB performance profile. A PDB performance profile configures resource plan directives for a set of PDBs that have the same priorities and resource controls. Directives control allocation of CPU and parallel execution servers. For example, you might create a performance profiles called Gold, Silver, and Bronze. Each profile specifies a different set of directives depending on the importance of the type of PDB. Gold PDBs are more mission critical than Silver PDBs, which are more mission critical than Bronze PDBs. A PDB specifies its performance profile with the DB_PERFORMANCE_PROFILE initialization parameter. You can use PDB lockdown profiles to specify PDB initialization parameters that control resources, such as SGA_TARGET and PGA_AGGREGATE_LIMIT. A lockdown profile prevents the PDB administrator from modifying the settings. Oracle recommends using matching names for performance profiles and lockdown profiles. To prevent PDB owners from switching profiles, Oracle recommends putting the PDB performance profile in the PDB lockdown profile. A directive can control the allocation of resources to PDBs based on the share value that you specify for each PDB or PDB performance profile. A higher share value results in more resources. For example, you can specify that one PDB is allocated double the resources allocated to a second PDB by setting the share value for the first PDB twice as high as the share value for the second PDB. Similarly, you can specify that one PDB performance profile is allocated double the resources allocated to a second PDB performance profile by setting the share value for the first PDB performance profile twice as high as the share value for the second PDB performance profile. The settings apply to the set of PDBs that use each profile. You can also specify utilization limits for PDBs and PDB performance profiles. The limit controls allocation to the PDB or performance profile. For example, the limit can control how much CPU a PDB gets as a percentage of the total CPU available to the CDB. You can use both shares and utilization limits together for precise control over the resources allocated to each PDB and PDB performance profile in a CDB. A task is mapped to a consumer group in the container that starts the task. If a task starts in the CDB root, then the task maps to a consumer group in the CDB root. If the task starts in a PDB, then the task maps to a consumer group in the PDB. Many maintenance and administrative tasks automatically map to a consumer group. For example, automated maintenance tasks map to ORA$AUTOTASK. In certain cases, the tasks map to a consumer group, but the mapping is modifiable. Such tasks include RMAN backup, RMAN image copy, Oracle Data Pump, and In-Memory population. Several initialization parameters control the memory usage of a PDB. The MAX_IOPS and MAX_MBPS initialization parameters limit the disk I/O generated by a PDB. The CPU_COUNT initialization parameter specifies the number of CPUs available for Oracle Database to use. The NONCDB_COMPATIBLE initialization parameter is set to false in the CDB root. The MEMORY_TARGET initialization parameter is not set or is set to 0 (zero) in the CDB root. Sets the minimum, guaranteed buffer cache space for the PDB. It must be less than or equal to 50% of the setting for the DB_CACHE_SIZE in the CDB root. The sum of the DB_CACHE_SIZE settings for all PDBs must be less than or equal to 50% of the setting for the DB_CACHE_SIZE in the CDB root. These requirements do not apply if the SGA_TARGET initialization parameter is set to a nonzero value in the CDB root. The values of DB_CACHE_SIZE plus SHARED_POOL_SIZE in a PDB must be less than or equal to 50% of the PDB’s SGA_TARGET value. The values of DB_CACHE_SIZE plus SHARED_POOL_SIZE in a PDB must be less than or equal to 50% of the SGA_TARGET value at the CDB level. The sum of DB_CACHE_SIZE plus SHARED_POOL_SIZE across all the PDBs in a CDB must be less than or equal to 50% of the SGA_TARGET value at the CDB level. Sets the minimum, guaranteed shared pool space for the PDB. It must be less than or equal to 50% of the setting for the SHARED_POOL_SIZE in the CDB root. The sum of the SHARED_POOL_SIZE settings for all PDBs must be less than or equal to 50% of the setting for the SHARED_POOL_SIZE in the CDB root. Sets the minimum SGA size for the PDB. It must be less than or equal to 50% of the setting for the SGA_TARGET in the CDB root. It must be less than or equal to 50% of the setting for the SGA_TARGET in the PDB. The sum of the SGA_MIN_SIZE settings for all PDBs must be less than or equal to 50% of the setting for the SGA_TARGET in the CDB root. These requirements do not apply if the SGA_TARGET initialization parameter is not set or is set to 0 (zero) in the CDB root. Sets the maximum SGA size for the PDB. The SGA_TARGET setting in the PDB is enforced only if the SGA_TARGET initialization parameter is set to a nonzero value in the CDB root. The SGA_TARGET setting in the PDB must be less than or equal to the SGA_TARGET setting in the CDB root. Sets the maximum PGA size for the PDB. It must be less than or equal to the setting for the PGA_AGGREGATE_LIMIT in the CDB root. It must be greater than or equal to two times the setting for the PGA_AGGREGATE_TARGET in the PDB. Sets the target aggregate PGA size for the PDB. It must be less than or equal to the PGA_AGGREGATE_TARGET value set at the CDB level. It must be less than or equal to 50% of the PGA_AGGREGATE_LIMIT initialization parameter value set at the CDB level. It must be less than or equal to 50% of the PGA_AGGREGATE_LIMIT value set in the PDB. A large amount of disk I/O can cause poor performance. Several factors can result in excess disk I/O, such as poorly designed SQL or index and table scans in high-volume transactions. If one PDB is generating a large amount of disk I/O, then it can degrade the performance of other PDBs in the same CDB. The MAX_IOPS initialization parameter limits the number of I/O operations for each second. The MAX_MBPS initialization parameter limits the megabytes for I/O operations for each second. If you set both preceding initialization parameters for a single PDB, then Oracle Database enforces both limits. Note that these limits are not enforced for Oracle Exadata, which uses I/O Resource Management (IORM) to manage I/Os between PDBs. If these initialization parameters are set with the CDB root as the current container, then the values become the default values for all containers in the CDB. If they are set with an application root as the current container, then the values become the default values for all application PDBs in the application container. When they are set with a PDB or application PDB as the current container, then the settings take precedence over the default settings in the CDB root or the application root. These parameters cannot be set in a non-CDB. The default for both initialization parameters is 0 (zero). If these initialization parameters are set to 0 (zero) in a PDB, and the CDB root is set to 0, then there is no I/O limit for the PDB. If these initialization parameters are set to 0 (zero) in an application PDB, and its application root is set to 0, then there is no I/O limit for the application PDB. Critical I/O operations, such as ones for the control file and password file, are exempted from the limit and continue to run even if the limit is reached. However, all I/O operations, including critical I/O operations, are counted when the number of I/O operations and the megabytes for I/O operations are calculated. You can use the DBA_HIST_RSRC_PDB_METRIC view to calculate a reasonable I/O limit for a PDB. Consider the values in the following columns when calculating a limit: IOPS, IOMBPS, IOPS_THROTTLE_EXEMPT, and IOMBPS_THROTTLE_EXEMPT. The rsmgr:io rate limit wait event indicates that a limit was reached. Instance caging is a technique that uses an initialization parameter to limit the number of CPUs that an instance can use simultaneously. You can set CPU_COUNT at the PDB level. If Resource Manager is enabled, then the PDB is “caged” (restricted) to the number of CPUs specified by CPU_COUNT. CPU_COUNT works the same way as the utilization_limit directive in the CDB plan. However, the CPU_COUNT limit is expressed in terms of number of CPUs rather than utilization percentage. If both the utilization_limit and CPU_COUNT are specified, then the lower limit is enforced. CPU_COUNT is advantageous because when the PDB is plugged into a new container, the CPU_COUNT setting remains with the plugged-in PDB. Also, Oracle Database uses the CPU_COUNT setting for a PDB to derive many other PDB parameters, such as those for parallel execution. Create CDB resource plans that allocate shares and resource limits for PDBs. To create a CDB resource plan for individual PDBs and define the directives for the plan, use the DBMS_RESOURCE_MANAGER package. This scenario illustrates each of the steps involved in creating a CDB resource plan for individual PDBs. Use the DBMS_RESOURCE_MANAGER package to create a CDB resource plan for PDB performance profiles and define the directives for the plan. Each PDB that uses a profile adopts the CDB resource plan directive. This scenario illustrates the steps involved in creating a CDB resource plan for PDB performance profiles. Modifying a CDB resource plan includes tasks such as updating the plan, creating, updating, or deleting plan directives for PDBs, and updating default directives. Disable the Resource Manager for a CDB by unsetting the RESOURCE_MANAGER_PLAN initialization parameter in the CDB root. To allocate resources among PDBs, assign a share value to each PDB or performance profile. A higher share value results in more guaranteed resources for a PDB or the PDBs that use the performance profile. A utilization limit restrains the system resource usage of a specific PDB or a specific PDB performance profile. Specify a share value for a PDB using the DBMS_RESOURCE_MANAGER.CREATE_CDB_PLAN_DIRECTIVE procedure and for a PDB performance profile using the DBMS_RESOURCE_MANAGER.CREATE_CDB_PROFILE_DIRECTIVE procedure. In both cases, the shares parameter specifies the share value for the PDB. Multiple PDBs can use the same PDB performance profile. The following figure shows an example of three PDBs with share values specified for them in a CDB resource plan. Description of "Figure 21-1 Shares in a CDB Resource Plan"
The preceding figure shows that the total number of shares is seven (3 plus 3 plus 1). The salespdb and the servicespdb PDB are each guaranteed 3/7 of the resources, while the hrpdb PDB is guaranteed 1/7 of the resources. However, any PDB can use more than the guaranteed amount of a resource when no resource contention exists. The following table shows the resource allocation to the PDBs in the preceding figure based on the share values. The table assumes that loads of the PDBs consume all system resources allocated. You can specify utilization limits for CPU and parallel execution servers. Utilization limits for a PDB are set by the CDB resource plan. The following table describes utilization limits for PDBs and the Resource Manager action taken when a PDB reaches a utilization limit. For limits specified with a PDB performance profile, the limit applies to every PDB that uses the PDB performance profile. For example, if pdb1 and pdb20 have a performance profile BRONZE, and if BRONZE has a limit set to 10%, then pdb1 has a 10% limit and pdb20 has a 10% limit. The CPU utilization limit for sessions connected to a PDB is set by the utilization_limit parameter in subprograms of the DBMS_RESOURCE_MANAGER package. The utilization_limit parameter specifies the percentage of the system resources that a PDB can use. The value ranges from 0 to 100. You can also limit CPU for a PDB by setting the initialization parameter CPU_COUNT. For example, if you set the CPU_COUNT to 8, then the PDB cannot use more than 8 CPUs at any time. If both utilization_limit and CPU_COUNT are specified, then the more restrictive (lower) value is enforced. You can limit the number of parallel execution servers in a PDB by means of parallel statement queuing. The limit is a “queuing point” because the database queues parallel queries when the limit is reached. For example, if the PARALLEL_SERVERS_TARGET initialization parameter is set to 200 in the CDB root, and if the parallel_server_limit directive for a PDB is set to 10%, then utilization limit for the PDB is 20 parallel execution servers (200 * .10). If the limit is set in both preceding ways, then the lower limit of the two is used. See Oracle Database Reference for the default value for PARALLEL_SERVERS_TARGET. Note: Oracle recommends using the PARALLEL_SERVERS_TARGET initialization parameter instead of the parallel_server_limit directive in a CDB plan. Resource Manager queues parallel queries when the number of parallel execution servers used by the PDB would exceed the limit. Note: In a CDB, parallel statements are queued based on the PARALLEL_SERVERS_TARGET settings at both the PDB and CDB level. A statement is queued when the number of parallel servers used by the PDB exceeds the target for the PDB or when the number of parallel servers used by all PDBs exceeds the target for the CDB. The following figure shows an example of three PDBs with shares and utilization limits specified for them in a CDB resource plan. Description of "Figure 21-2 Shares and Utilization Limits in a CDB Resource Plan"
The preceding figure shows that there are no utilization limits on the salespdb and servicespdb PDBs because utilization_limit and parallel_server_limit are both set to 100% for them. However, the hrpdb PDB is limited to 70% of the applicable system resources because utilization_limit and parallel_server_limit are both set to 70%. This scenario assumes that the PARALLEL_SERVERS_TARGET initialization parameter does not specify a lower limit in a PDB. When the PARALLEL_SERVERS_TARGET initialization parameter specifies a lower limit for parallel execution servers in a PDB, the lower limit is used. The following table shows the attributes of the initial default directive for PDBs. Figure 21-3 shows an example of the default directive in a CDB resource plan. Description of "Figure 21-3 Default Directive in a CDB Resource Plan"
Figure 21-3 shows that the default PDB directive specifies that the share is 1, the utilization_limit is 50%, and the parallel_server_limit is 50%. Any PDB that is part of the CDB and does not have directives defined for it uses the default PDB directive. Figure 21-3 shows the PDBs marketingpdb and testingpdb using the default PDB directive. Therefore, marketingpdb and testingpdb each get 1 share and utilization limits of 50. The directives are defined using various procedures in the DBMS_RESOURCE_MANAGER package. The attributes of each directive are defined using parameters in these procedures. Table 21-5 describes the types of directives in the plan. 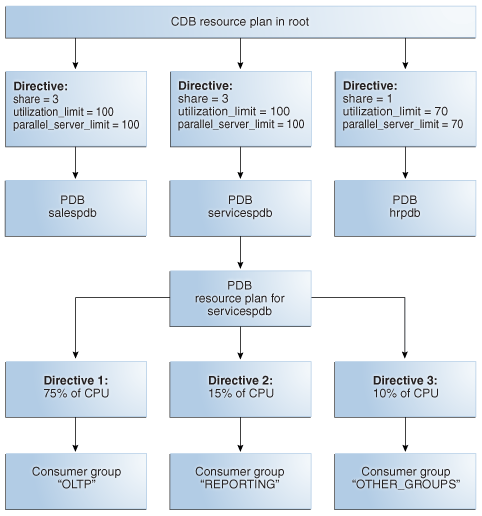 Resource allocation share for CPU and parallel execution server resources. "Shares for Allocating Resources to PDBs"
Resource utilization limit for CPU. Maximum percentage of parallel execution servers that a PDB can use before queuing parallel statements. When the parallel_server_limit directive is specified for a PDB, the limit is the PARALLEL_SERVERS_TARGET value of the CDB root multiplied by the value of the parallel_server_limit parameter in the CREATE_CDB_PLAN_DIRECTIVE procedure. Table 21-6 describes how the CDB resource plan allocates resources to its PDBs using the directive attributes described in Table 21-5. Create directives for the PDB performance profiles using the CREATE_CDB_PROFILE_DIRECTIVE procedure. For each PDB that will use a profile, set the DB_PERFORMANCE_PROFILE initialization parameter and specify the profile name. The scenario assumes that you want to create a CDB resource plan for a CDB named newcdb. The plan includes a directive for each PDB performance profile. In this scenario, you also update the default directive and the AutoTask directive. In the CDB resource plan, you give each profile a name. In each PDB, you set the DB_PERFORMANCE_PROFILE initialization parameter to specify which PDB performance profile the PDB uses. The directives are defined using various procedures in the DBMS_RESOURCE_MANAGER package. The attributes of each directive are defined using parameters in these procedures. The following table describes the types of directives in the plan. When the parallel_server_limit directive is specified for a PDB performance profile, the limit is the value of the PARALLEL_SERVERS_TARGET initialization parameter setting in the CDB root multiplied by the value of the parallel_server_limit parameter in the CREATE_CDB_PROFILE_DIRECTIVE procedure. The following table describes how the CDB resource plan allocates resources to its PDB performance profiles using the directive attributes described in Table 21-7. For each PDB that will use a profile, set the DB_PERFORMANCE_PROFILE initialization parameter to the name of the profile that the PDB will use. Run an ALTER SYSTEM statement to set the parameter. The default directive applies to PDBs for which specific directives have not been defined. "The Default Directive for PDBs"
Before enabling a CDB resource plan, complete the prerequisites described in "Overview of Oracle Resource Manager in a Multitenant Environment". You can create, update, and delete CDB resource plan directives for a PDB. You can create, update, and delete CDB resource plan directives for a PDB performance profile. Before updating a CDB resource plan, complete the prerequisites described in "Overview of Oracle Resource Manager in a Multitenant Environment". Before creating a new CDB resource plan directive for a PDB, complete the prerequisites described in "Overview of Oracle Resource Manager in a Multitenant Environment". Before updating a CDB resource plan directive for a PDB, ensure that you meet the prerequisites described in "Overview of Oracle Resource Manager in a Multitenant Environment". Before deleting a CDB resource plan directive for a PDB, complete the prerequisites described in "Overview of Oracle Resource Manager in a Multitenant Environment". You can create a CDB resource plan directive for the a new PDB performance profile using the CREATE_CDB_PROFILE_DIRECTIVE procedure. The directive specifies how resources are allocated to the all PDBs that use the new profile. Update the CDB resource plan directive for a PDB performance profile using the UPDATE_CDB_PROFILE_DIRECTIVE procedure. The directive specifies how resources are allocated to the PDBs that use the PDB performance profile. You can delete the CDB resource plan directive for a PDB performance profile using the DELETE_CDB_PROFILE_DIRECTIVE procedure. Before creating a new CDB resource plan directive for a PDB performance profile, complete the prerequisites described in "Overview of Oracle Resource Manager in a Multitenant Environment". Run the CREATE_CDB_PROFILE_DIRECTIVE procedure, and specify the appropriate values for the new PDB performance profile. For a PDB to use the new profile, the PDB must have the DB_PERFORMANCE_PROFILE initialization parameter set to the profile name. Before updating a CDB resource plan directive for a PDB performance profile, complete the prerequisites described in "Overview of Oracle Resource Manager in a Multitenant Environment". Run the UPDATE_CDB_PROFILE_DIRECTIVE procedure, and specify the new resource allocation values for the PDB performance profile. If no PDBs use a performance profile, then you might delete the directive for the profile. Before deleting a CDB resource plan directive for a PDB performance profile, complete the prerequisites described in "Overview of Oracle Resource Manager in a Multitenant Environment". Run the DELETE_CDB_PROFILE_DIRECTIVE procedure, and specify the CDB resource plan and the PDB performance profile. "About Container Access in a CDB". Before updating the default directive for PDBs in a CDB resource plan, complete the prerequisites described in "Overview of Oracle Resource Manager in a Multitenant Environment". Before updating the default directive for maintenance tasks in a CDB resource plan, complete the prerequisites described in "Overview of Oracle Resource Manager in a Multitenant Environment". Before deleting a CDB resource plan, complete the prerequisites described in "Overview of Oracle Resource Manager in a Multitenant Environment". A CDB resource plan that specifies shares or utilization limits for PDBs is required to enable CPU management, both between PDBs and within a PDB. If a resource plan with shares or utilization limits is enabled for a PDB, and if the CDB resource plan is not specified, then the CDB resource plan is set to DEFAULT_CDB_PLAN. This setting gives equal shares to all PDBs and specifies no utilization limits. To disable CPU resource management throughout the CDB, set RESOURCE_MANAGER_PLAN to ORA$INTERNAL_CDB_PLAN. Before disabling a CDB resource plan, complete the prerequisites described in "Overview of Oracle Resource Manager in a Multitenant Environment". An example illustrates using the DBA_CDB_RSRC_PLANS view to display all CDB resource plans defined in the CDB. An example illustrates using the DBA_CDB_RSRC_PLAN_DIRECTIVES view to display all directives defined in all CDB resource plans in the CDB. Start SQL*Plus or SQL Developer, and log in to the CDB root. The DEFAULT_CDB_PLAN is a default CDB plan that is supplied with Oracle Database. 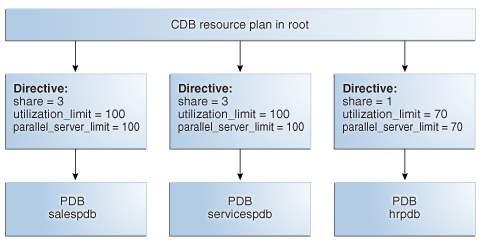 With DEFAULT_CDB_PLAN, every PDB has 1 share and a utilization limit of 100. You can use this default plan if it meets your requirements. Note that ORA$DEFAULT_PDB_DIRECTIVE is the default directive for PDBs. The preceding output shows the directives for the newcdb_plan created in "Creating a CDB Resource Plan for Managing PDBs: Scenario" and modified in "Modifying a CDB Resource Plan". A PDB resource plan determines how the resources for a specific PDB are allocated to consumer groups within this PDB. Enable a PDB resource plan by setting the RESOURCE_MANAGER_PLAN initialization parameter to the plan with an ALTER SYSTEM statement when the current container is the PDB. A PDB resource plan is similar to a resource plan for a non-CDB. A PDB resource plan differs from a CDB resource plan, which determines the amount of resources allocated to each PDB. If you create a PDB using a non-CDB, and the non-CDB contains resource plans, then these resource plans might not conform to the preceding restrictions. In this case, Oracle Database automatically transforms these resource plans into equivalent PDB resource plans that meet these requirements. The original resource plans and directives are recorded in the DBA_RSRC_PLANS and DBA_RSRC_PLAN_DIRECTIVES views with the LEGACY status. When you create PDB resource plans, the CDB resource plan must meet certain requirements. A one-to-many relationship exists between CDB resource plans and PDB resource plans. Create directives for a CDB resource plan by using the DBMS_RESOURCE_MANAGER.CREATE_CDB_PLAN_DIRECTIVE procedure. Create directives for a PDB resource plan using the CREATE_PLAN_DIRECTIVE procedure in the same package. 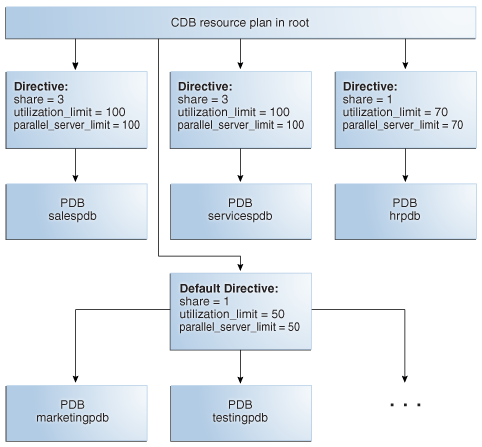 When you create one or more PDB resource plans and there is no CDB resource plan, the CDB uses the DEFAULT_CDB_PLAN that is supplied with Oracle Database. The following table describes the requirements for the CDB resource plan and the results when the requirements are not met. The parameter values described in the "CDB Resource Plan Requirements" column are for the CREATE_CDB_PLAN_DIRECTIVE procedure. The parameter values described in the "Results When Requirements Are Not Met" column are for the CREATE_PLAN_DIRECTIVE procedure. The parallel server limit specified by parallel_server_limit in the PDB resource plan is not enforced. However, you can set the PARALLEL_SERVERS_TARGET initialization parameter in a PDB to enforce the parallel limit. The following figure shows an example of a CDB resource plan and a PDB resource plan. Description of "Figure 21-4 A CDB Resource Plan and a PDB Resource Plan"
The preceding figure shows some of the directives in a PDB resource plan for the servicespdb PDB. Other PDBs in the CDB can also have PDB resource plans. Ensure that the current container is a PDB and that the user has the required privileges when you complete these steps. See Oracle Database Administrator’s Guide for detailed information about completing these steps. You also have the option of creating a simple resource plan that is adequate for many situations using the CREATE_SIMPLE_PLAN procedure. See Oracle Database Administrator’s Guide for information about creating a simple resource plan. Some restrictions apply to PDB resource plans. See "About PDB Resource Plans" for information. Before enabling a PDB resource plan, complete the prerequisites described in "Overview of Oracle Resource Manager in a Multitenant Environment". You can also schedule a PDB resource plan change with Oracle Scheduler. Before modifying a PDB resource plan, complete the prerequisites described in "Overview of Oracle Resource Manager in a Multitenant Environment". Before disabling a PDB resource plan, complete the prerequisites described in "Overview of Oracle Resource Manager in a Multitenant Environment". You can monitor the results of your Oracle Database Resource Manager settings for PDBs using views. The V$RSRCPDBMETRIC view enables you to track CPU metrics in milliseconds, in terms of number of sessions, or in terms of utilization for the past one minute. The V$RSRCPDBMETRIC view enables you to track parallel statements and parallel server use for PDBs. The V$RSRCPDBMETRIC view enables you to track the amount of I/O generated by PDBs. The V$RSRCPDBMETRIC view enables you to track the amount memory used by PDBs. The V$RSRCPDBMETRIC view provides current statistics on resource consumption for PDBs, including CPU usage, parallel execution, I/O generated, and memory usage. The columns in the V$RSRCPDBMETRIC_HISTORY view are the same as the columns in the V$RSRCPDBMETRIC view. The only difference between these views is that the V$RSRCPDBMETRIC view contains metrics for the past one minute only, whereas the V$RSRCPDBMETRIC_HISTORY view contains metrics for the last 60 minutes. The V$RSRC_PDB view provides cumulative statistics. The statistics are accumulated since the time that the CDB resource plan was set. This view contains the historical statistics of V$RSRCPDBMETRIC_HISTORY, taken using Automatic Workload Repository (AWR) snapshots. The V$RSRCPDBMETRIC and V$RSRCPDBMETRIC_HISTORY views record statistics for resources that are not currently being managed by Resource Manager when the STATISTICS_LEVEL initialization parameter is set to ALL or TYPICAL. The view provides real-time metrics for each PDB and is very useful in scenarios where you are running workloads and want to continuously monitor CPU resource utilization. For example, you can view the amount of CPU resources a PDB used and how long it waited for resource allocation. Alternatively, you can view how many sessions from each PDB are executed against the total number of active sessions. To track CPU consumption in terms of CPU utilization, query the CPU_UTILIZATION_LIMIT and AVG_CPU_UTILIZATION columns. AVG_CPU_UTILIZATION lists the average percentage of the server's CPU that is consumed by a PDB. CPU_UTILIZATION_LIMIT represents the maximum percentage of the server's CPU that a PDB can use. This limit is set using the UTILIZATION_LIMIT directive attribute. Use the CPU_CONSUMED_TIME and CPU_TIME_WAIT columns to track CPU consumption and throttling in milliseconds for each PDB. The column NUM_CPUS represents the number of CPUs that Resource Manager is managing. To track the CPU consumption and throttling in terms of number of sessions, use the RUNNING_SESSIONS_LIMIT, AVG_RUNNING_SESSIONS, and AVG_WAITING_SESSIONS columns. RUNNING_SESSIONS_LIMIT lists the maximum number of sessions from a particular PDB that can be running at any time. This limit is defined by the UTILIZATION_LIMIT directive attribute that you set for the PDB. AVG_RUNNING_SESSIONS lists the average number of sessions that are consuming CPU, and AVG_WAITING_SESSIONS lists the average number of sessions that are waiting for CPU. Parallel execution servers for a PDB are managed with the active CDB resource plan of the PDB's CDB. To track parallel statements and parallel server use for PDBs, use the AVG_ACTIVE_PARALLEL_STMTS, AVG_QUEUED_PARALLEL_STMTS, AVG_ACTIVE_PARALLEL_SERVERS, AVG_QUEUED_PARALLEL_SERVERS, and PARALLEL_SERVERS_LIMIT columns. AVG_ACTIVE_PARALLEL_STMTS and AVG_ACTIVE_PARALLEL_SERVERS list the average number of parallel statements running and the average number of parallel servers used by the parallel statements. AVG_QUEUED_PARALLEL_STMTS and AVG_QUEUED_PARALLEL_SERVERS list the average number of parallel statements queued and average number of parallel servers that were requested by queued parallel statements. PARALLEL_SERVERS_LIMIT lists the number of parallel servers allowed to be used by the PDB. I/O is limited for a PDB by setting the MAX_IOPS initialization parameter or the MAX_MBPS initialization parameter in the PDB. Use this view to compare the I/O generated by PDBs in terms of the number of operations each second and the number of megabytes each second. To track the I/O operations generated each second by PDBs during the previous minute, use the IOPS column. To track number of megabytes generated for I/O operations each second by PDBs during the previous minute, use the IOMBPS column. Use this view to track the amount of SGA, PGA, buffer cache, and shared pool memory currently used by PDBs. To track the current memory usage, in bytes, for specific PDBs, use the SGA_BYTES, PGA_BYTES, BUFFER_CACHE_BYTES, and SHARED_POOL_BYTES columns.